WSU research team will study refrigeration storage in hopes that there will be fewer losses from parasites during almond pollination. 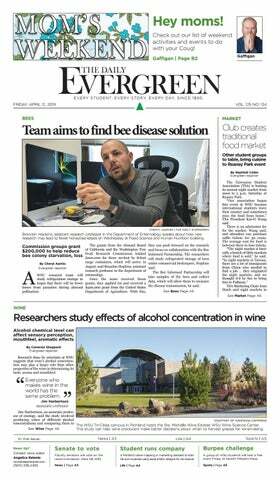 Research done by scientists at WSU suggests that wine’s alcohol concentration may play a larger role than other properties of the wine in determining its taste, aroma and mouthfeel. Everyone who makes wine in the world has the same problem. Faculty senators will vote on the recommendation titles fall 2019. A Portland native majoring in marketing decided to start his own business using local artists’ designs for his boards. A group of WSU students will host a free event Friday to benefit Hilinski’s Hope. Community Calendar Friday 4/12 Come to the Nuthouse Mom’s Weekend comedy show performance. Starting at 8 p.m., the popular improvisational comedy group will entertain you and your mom for the ticket price of $10 cash only at the door. The performance will be in the Chinook Student Center, Room 150. The Saturday performance will have shows at both 2 and 8 p.m. in the same location. This event is hosted by STAGE Student Theatre at WSU. Saturday 4/13 The Taiwanese Student Association will bring a traditional Taiwanese market to Reaney Park. The student group will table at Reaney Park, 690 Reaney Way, from noon to 5 p.m. The event is in collaboration with other resident student organizations and will include authentic food from different cultures. There is no entry fee but raffle tickets will be on sale for purchasing food. To submit, email events to meditor@dailyevergreen.com. Preference will be given to events that are free and open to the public or are hosted by an RSO, and must include time, date and place. Police log Tuesday Other Law Enforcement Calls Pullman, 6:33 a.m. Reporting party would like to share some information with officer’s regarding her son. Officer advised. Fraud SW Center Street, 7:57 a.m. Reporting party needs to speak with an officer about an email she received that is fraudulent. Officer contacted the party. Accident Hit and Run N Grand Avenue, 8:21 a.m. Reporting party advised of a hit and run that occurred 10-15 minutes ago. The vehicle turned into the reporting party causing him to hit them and then it continued on. Officer responded. Traffic Hazard SE Terre View Drive & SR 270, 8:37 a.m. Reporting party reporting a dead animal in roadway. Officer responded, advised the animal is off the road. Citizen Assist N Grand Avenue, 9:03 a.m. Reporting party requests traffic control while he tows a vehicle from last night’s flood. Assistance provided. Traffic Violation E Main Street & NE Kamiaken Street, 10:53 a.m. Third-party report of a vehicle versus pedestrian collision. Officer contacted parties involved. Traffic Violation NE Providence Court, 11:22 a.m. Reporting party reported a vehicle that speeds through the parking lot on a regular basis. Officer contacted the party. Welfare Check NW Webb Street, 3:48 p.m. Reporting party advised that his ex is smoking meth with a baby present. Neighbor contacted him and told him that the baby cries a lot. Officer responded. Theft Other E Main Street, 5:33 p.m. Reporting party reported a customer left without paying for gas. Officer responded. In the Stars | Horoscopes Today’s Birthday —— Try new flavors, ideas and scenery this year. Professional success requires doing your homework diligently. Good fortune follows solid work. Summer domestic blossoming leads to a professional plot twist. Reach a career pinnacle next winter, before attention shifts to home and family. Learn and grow. Aries (March 21 - April 19) —— Domestic breakdowns could require your attention. Beautify the situation. Keep communicating. Choose what is best for your family. Use your charm to soothe ruffled feathers. Taurus (April 20 - May 20) —— Put your heart into creative projects. Selfdiscipline pays off. You can see what wasn’t working. Collaborate with talented editors. Keep practicing your art. Express your view. Gemini (May 21 - June 20) —— Financial challenges could arise. Avoid a conflict of interests. Stay in communication with your crew, partners and vendors. Make deals and bargains. Every bit helps. Cancer (June 21 - July 22) —— Imagine yourself winning. Make practical plans for a personal project. Obstacles could seem daunting. Get rid of excess baggage. Study the situation. Stay focused. Leo (July 23 - Aug. 22) —½— Relax and observe. Watch for a change. Review and revise plans, budgets and long-term objectives. Recycle and reuse resources to new purpose. Enjoy peaceful moments. Virgo (Aug. 23 - Sept. 22) —½— Friends can help you make a distant connection. Do the homework for a possible team collaboration. Play your part. Call if you’ll be late. Libra (Sept. 23 - Oct. 22) —— A professional challenge has your attention. File papers and monitor inventories, budgets and accounts. Go for clarity. Get support when needed. Don’t take things personally. Scorpio (Oct. 23 - Nov. 21) —½— An outing can be fun and valuable. Have patience with obstacles and barriers along the road. Avoid extravagance or distractions. Accept a gift. Sagittarius (Nov. 22 - Dec. 21) —— Collaborate for a financial goal. Confront tough questions. Spend carefully. Respect age and authority. Work to increase profits. Sell or give away excess stuff. Practice frugality. Capricorn (Dec. 22 - Jan. 19) —½— Love helps you stay on the right path. Collaborate to resolve a challenge. A breakdown is temporary. Two heads are better than one. Support each other. Aquarius (Jan. 20 - Feb. 18) —— Keep a physical objective in mind. Make an investment in your health and wellness. Anticipate resistance. Slow to avoid accidents. Use gentle finesse rather than force. Pisces (Feb. 19 - March 20) —— Indulge your own passions and enthusiasms without overspending or overindulging. Stay out of someone else’s argument. Relax and enjoy fun with family and your sweetheart. Faculty senators will vote this coming fall on whether or not they approve of the recommended changes for WSU tracks and appointment titles. Judi McDonald, faculty senate past chair, said the senate has the absolute power to determine the ideal tracks and appointment titles for faculty and then make changes. from a tenure-track position to a non-tenure track. Sanchez said instructors who have worked for decades have held appropriate titles and feel that the recommended titles may not represent them well. Thoma said she suggested referring to some faculty as career-track rather than temporary. recognition of working with the university for a long time may bring a bad distinction between career faculty and short-term faculty. “I think we have an ethical responsibility [of] being considered what this vision could put in place down the line in other aspects in the university,” Sanchez said. of normal and the Bruneau 121 percent of normal as of last week. Ron Abramovich, water supply specialist for NRCS Snow Survey in Idaho, told the Idaho Outfitters and Guides Association that “all of the snow is going to provide a great runoff season,” according to a press release. Dustin Aherin, the owner of Idaho River Adventures, agreed, although he emphasized that much can change in the next month or so. “It is looking to be a perfect river season at this point, though the next six weeks will really be the deciding factor in that,” he said in an email. “The snowpack in the Salmon River drainage is just above normal, a great spot to be. This should mean a fun start to the river season in late May/ June with fun whitewater, then a good water year throughout the remainder of the summer with the flow hopefully not getting too terribly low.” Aside from running the river, the above-average snowpack is good for cold water fisheries on the Salmon and Clearwater drainages. Aherin said that will keep “the river temps cool enough to be healthy for the native Westslope cutthroat we fish for on the Middle Fork Salmon as well as the wild steelhead and salmon that will be migrating as smolts to the ocean as well as the adults returning to spawn later in the summer.” Rafting companies watch the weather avidly. Too much snow can make rivers dangerous. “We do cancel trips when it’s necessary,” Grubb said. group of six WSU sport management students with the goal of raising mental health awareness and destigmatizing the illness. All people have to do is record a video of themselves doing 3 burpees, challenge 3 friends to do it and post it on social media. WSU baseball will look for its third series win of the season when they host Oregon for a three-game series starting Friday. The Cougars (7-23, 0-9) are coming off losses in a threegame road series against Cal this past weekend. wines made from grapes of varied maturity. The wines were blind-taste-tested by a panel of trained tasters for a descriptive analysis of their flavors and properties. He said this study provides a basis to help winemakers understand how alcohol concentration affects the flavor, aroma and mouthfeel of their wine. “We wanted to understand what elements are present that are really affecting things,” Harbertson said. He said alcohol has a lot of chemical effects that influence the sensory perception of wine more than flavor alone. Alcohol can affect the viscosity and body of wine. It can inhibit a nerve response, causing a hot or burning feeling. It can also have aromatic effects. ripens at different rates. “This problem is universal,” Harbertson said. “Everyone who makes wine in the world has the same problem.” Kay Simon, a wine producer at Chinook Wines and collaborator on this study, said soluble solids like sugars increase in grapes as they mature, and this subsequently affects the ethanol content of the wine, so deciding when to harvest grapes is important for wine style and quality. Harbertson said this study will help wine producers understand what characteristics their wine will assume if they harvest their grapes earlier or later in the season. “They can ... start making more informed decisions about what they are doing,” he said. Masses Sunday 10 am & 7 pm Tuesday-Friday 5:30 pm Confessions Sunday 9 am & 6 pm Tue-Thurs 5:00 pm 820 NE B Street Pullman, WA . gave the “boring” dress a slightly edgier look. “A lot of designers love the process, like the sketching or the sewing — I hate all of that,” Robinson said. “I just want to see the final product on a person. Starting a vision, working through the vision and having it be exactly what you imagined is the most rewarding feeling.” Robinson’s patchwork jacket will be featured in the Mom’s Weekend Fashion Show at 6 p.m. Friday in Beasley Coliseum. Admission is $15 in advance and $20 at the door. skate, but if the weather doesn’t allow him to, he’s watching skateboard videos or working on things involved with Yew,” Stoppard said. Stoppard also said it is inspiring to watch Moncrieff run Yew because he started the company years ago, and now runs it successfully as a college student. Even if Yew does not become a large company one day, Moncrieff said he still intends on running the company after college. His company combines two of his biggest passions, he said. “I do art all the time, and I skateboard all the time,” Moncrieff explained. Moncrieff’s favorite pro-skateboarder is Cory Kennedy, a Seattle native. Moncrieff said Kennedy is the reason he continued skating through his teenage years. He even said they look alike. “His style of skating and the way he comes off is a full circle of who I strive to be,” Moncrieff said. You can keep up with Yew on Instagram or Facebook with the handle YewSkateboards, or using the company’s website. 1 br 1 apt. above Richard’s Fade Shop, next to The Coug. Avail June 1, $780/mo. Text 509-217-1076. Wil-Ru Apartments has 1 & 2 bedroom apartments available. Call 509-332-5631. A central repository of health information connecting medical offices and hospitals in the region and across Washington. 45,000 square-foot facility on the northwest end of campus to allow space for team medicine, care coordination, and co-location of services. Keeping pace with advancements of medical technology and equipment. Redesigning space to create greater efficiencies and an improved patient experience. 25 games, we’re going to try to be the best we can.” Freshman right-handed pitcher Brandon White has started seven games this season and has a 2-4 record. He has a 4.64 ERA and 33 strikeouts in 33 innings pitched. White said he is excited about playing at home. “It’s always fun to travel, but it’s going to be nice to be in Pullman for this one, especially with how much we’ve traveled this year,” White said. “We’re looking forward to hopefully a big crowd. I know that my family will be here for Mom’s Weekend.” Looking ahead to Oregon, White said he was aware of the talent on the team. “They have a couple guys that are out right now, but they’re playing good,” White said. “They beat Oregon State, and they’re a competitive team. We’re going to have to play the best we can to get a win.” The Ducks have four players with a batting average over .300 but they lack a dominant pitcher as each of their starters has an ERA of 3.79 or higher. First pitch is set for 5:05 p.m. Friday at Bailey-Brayton Field. The game can also be seen on the WSU live stream. Comedian Jim Gaffigan will perform for Mom’s Weekend this year at Beasley Coliseum on Saturday as a part of his “Quality Time” tour. He was supposed to perform at another Mom’s Weekend several years ago but had to cancel due to the premiere of his TV show. Award-winning comedian Jim Gaffigan will perform Saturday at Beasley Coliseum as part of his “Quality Time” tour. This performance will be one of the largest events on campus during Mom’s Weekend, with an expected attendance of about 7,000 people. Tour the Veterinary Teaching Hospital, learn about student clubs, see the internal organs painted on a horse and cow, and meet Butch T. Cougar! From face painting and pet safety tips to unique pathology specimens and acupuncture demonstrations, there’s something for all ages and interests. merchandising, design and textiles major, who will be attending the performance with her mom. “I was kind of more hoping for a concert, so when a comedian came out, I was like ‘oh this’ll be weird,’ but I’ve heard so many good things.” Gaffigan is aware it is Mom’s Weekend and the audience will be full of parents. Gaffigan himself is the father of five children and will likely speak about his experiences. Gaffigan’s humor will definitely relate to the audience, Udy said. “When you talk to your mom way more now than you ever did in high school, jokes like that is something that he would flourish with here,” Duquaine said. Cougs and moms interested in attending the performance can find ticket information online on the Beasley Coliseum website. The performance begins at 7:30 p.m. Saturday, but doors open at Beasley Coliseum at 6:30. Udy recommended attendees arrive early to find their seats. local vendors of vintage, antique and artisan items, Thorson said. “Without [the items] being crafts,” Thorson said. “It’s a fine line.” This is the fourth vintage market the trio has organized. Anderson said the market was organized because the Colfax area needed more events like this. They said they have received a lot of local support and business as they have had to move from a school gymnasium in Colfax to a larger space at the fairgrounds. “We want people to have an enjoyable experience,” Schwartz said. “Not just the shoppers, but the vendors too.” Anderson said she hopes shoppers will leave feeling like they got good deals on items. “The vendors are not here to get rich,” Anderson said. “They love what they do.” Thorson said the market will be worth the trip for moms in the area for Mom’s Weekend. The fairgrounds are located in Colfax at 310 N Main St. The WSU football team is putting on a football clinic on from 4:30–8:30 p.m. today for moms and Cougs alike. Preregistration for the event is required to attend. which will be given to one lucky mom. The winner will be decided through a raffle contest with tickets given to all moms upon entry. Proceeds will go toward supporting the club in future tournaments and other expenses, she said, and the club raised about $1,200 during last year’s event. “It is sort of a fundraising event for the club,” Bowman said. Wittenberg said the event, which has been going on for 8 years under Bowman’s management, was a great hit last year with an attendance of about 100 people. “There were so many people last time that we had to turn some people away,” said Wittenberg. She said interested individuals have the option to save a spot on the lane by signing up at the front desk of Zeppoz. The club’s men and women’s team has been ranked top 90 in the nation, Bowman said, and they play against some of the best collegiate teams in the U.S. The club participated in two tournaments last year in Las Vegas, Nevada and Arizona, he said, which went well. He said the women’s team bagged two first places. Zeppoz is located at 780 Bishop Blvd. Chuck Cody, plant growth facilities manager for the School of Biological Sciences at WSU, says he often gives gardening advice during Mom’s Weekend open houses on Tuesday afternoon at the Abelson Hall Greenhouse. we sell, from the honey to the chocolates, are all very good quality.” Alexander Walker, sales associate at Ferdinand’s, said Mom’s Weekend gets just as busy as WSU home football games, possibly even busier. They clear out all the furniture to make room for the expected lines. Needham said moms start to come in on Thursday and continue to visit until Saturday. “I generally see moms start coming in on Thursday, Friday will be busy in the afternoon, and Saturday we are open 9:30 a.m. to 4:30 p.m. and we are busy with lines out the door and onto the street,” Needham said. become creamier. The inclusions, such as candy, are added into the ice cream and stored in a freezer. Walker said other than the Lemon Chiffon, the two most famous flavors at Ferdinand’s are Huckleberry Ripple and Cougar Tracks. “I think we keep our prices pretty competitive when it comes to cheese and ice cream,” he said. “I know for ice cream we sell tons of it to students and you get a pretty good serving for only $2.35.” Walker said Ferdinand’s gets alumni who attended WSU when it was called WSC before it was an established university. “It’s so cool when we get older alumni who come down and they tell me they remember when Ferdinand’s was in Troy Hall,” he said. Needham said lines are expected to be exceptionally long after 11 a.m. Saturday. One Tree Cider House from Spokane, as well as many others. “We try to target different wineries from around the Pacific Northwest,” said Winefest event coordinator Spenser Peery, who is also a senior strategic communication major. “A lot of them are from around the area, and all of them are from Washington state this year.” Peery said Sigma Iota promotes student work at its events. For the food-pairing portion of the event, the hospitality school catering company will cater it. All club members have helped in the kitchen throughout the week as well, Peery said. A live band from the School of Music will perform. “So we’re incorporating other student groups from campus,” Peery said. “A lot of the different hospitality clubs are helping out with it for decorations and catering.” The cost for registering online is $50 per person, and tickets will be available at will call, or tickets can be purchased at the door for $60 per person. 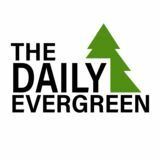 The price includes a buffet catered by the hospitality team, a commemorative wine glass JOSEPH GARDNER | THE DAILY EVERGREEN that you get to keep and ten tickets to taste among the many White wine fills a Valhalla Wine Festival glass on Tuesday at Valhalla Bar and Grill. Spenser Peery says the annual Winefest vintners available. combines several hospitality groups on campus, which helps these students get more experience in their field. Madison Lucas, a greenhouse employee and senior chemistry major, said she could stay in the greenhouse for years. She has worked at at the greenhouse for about two years. She said the succulents, cacti, ferns and orchids are a few plants that capture the majority of attention during Mom’s Weekend. “Everything is worth looking at,” Lucas said. “You could come here 10 times and still find new plants.” Cody said the greenhouse offers a tropical collection of plants, which is always open and located on the seventh floor of Abelson Hall. Some students who had classes in the greenhouse before know it is always open, he said, and will bring their families before the official open house starts. Cody said the greenhouse has held open house events every Mom’s Weekend since 1986. During last year’s Mom’s Weekend, about 500 people visited the greenhouse on Saturday alone, he said. Cody said families will look around the greenhouse, and he would answer questions they have about any of the plants. He said he gets more questions about gardening than the greenhouse plants itself. “I feel like an extension agent,” he said with a hearty laugh. “I’m answering all these gardening questions, which is fine. I enjoy doing that too.” The sensitive plant is a perennial favorite among visitors, Cody said. The leaves close and shrink when touched. The lighter leaves on the tips tend to be more reactive to touch than the older leaves. Lucas said the Vinca rosea, also called the Madagascar periwinkle, a plant with white and pink flowers, serves as a medicinal herb. She said that although plants are pretty to look at, they also hold secrets that are interesting to learn about. Moms have the opportunity to attend free yoga classes and have a complimentary brunch with their child during Mom’s Weekend. Judy Kolde, owner of Sanctuary Yoga in downtown Pullman, said she expects hundreds of people to attend their free yoga classes throughout the weekend, as well as the main bash on Saturday. This is the sixth year Sanctuary Yoga will host a Mom’s Weekend event. “It’s a great way to say thank you to the community and celebrate moms,” Kolde said. The festivities begin at 5:30 p.m. Friday with “Vino and Vinyasa,” where moms can drink a free glass of wine after a yoga class. The main event will begin at 8 a.m. and lasts until 3 p.m. on Saturday. The event will begin with a free self-serve waffle bar from Main Street Squeeze. The first 50 visitors can receive a free cupcake from Sweetest Crumbs. Sanctuary will offer complimentary mimosas and flavored prosecco, Kolde said. Sales associate Alexander Walker shares the plans to remain open for Mom’s Weekend as well as serving a very popular lemon flavor of ice cream that is loved by both moms and students Tuesday morning at the Ferdinand’s Ice Cream production observation room. chalk talk, offense, defense and special teams, showing them some plays,” said Dave Nichol, the inside receiver coach. “It is kind of a question and answer session. They get to have the feeling of running out of the tunnel.” Players from the WSU football team will be making appearances, some with moms coming up for the weekend to join them. press box in Martin Stadium. “It is just about having fun, I know that some moms sign up but don’t want to do the on-field drills, which is fine,” Thackery said. “It is just mainly to get connected, learn more about football, meet some of the players, just a laid-back relaxed way to enjoy football. President Kamu Taulelei, left, and treasurer Pesi Taototo of Mitamitaga O Samoa discuss the history of the Fiafia festival. registered student organization of the year, MOS has been working to maintain a higher standard of integrity. “We’ve been practicing our dances for the Fiafia festival since the beginning of the semester,” Taototo said. “The past few weeks we’ve been practicing every day for hours.” One of the main reasons why the MOS established itself as a recognized organization on campus was to help Samoan people at WSU feel welcome. With the Samoan population at WSU being comparatively small, the Fiafia festival is a great opportunity to show off culture, music, dances and traditions with others in the Palouse. “You end up finding out there’s a lot more Samoan people here at WSU than you thought,” Taulelei said. “You see someone you’ve never seen before show up and it brings that sense of happiness knowing that someone was looking for that certain community that we provided.” Tickets can be found online through the MOS Facebook page, or contact wsumitamitagaosamoa@gmail.com for more information on their CashApp and Venmo accounts. Student tickets are $14, non-student tickets are $18 and children under four get in for free. “There’s a Samoan quote that translates to ‘we may be small, but our impact can be big,” said Taototo. helmet, Gleason said. If someone does not wish to bid on something, they can choose to donate money to the club, Gleason said. The Raptor Club has fundraised this way for a number of years, and the auction is its main source of money, Lique said. The 36th annual Mom’s Weekend Fashion Show will premiere at 6 p.m. Friday in Beasley Coliseum. Tickets bought in advance cost $15, while tickets bought at the door cost $20. There will also be a beer and wine garden hosted from 5:00 to 5:45 p.m. before the show. The theme for this year’s fashion show is “Emerge.” According to Katie Ellis, one of the senior designers for the show, they searched for a long time for the perfect word to describe the show. After much deliberation, they settled on “Emerge” because they felt it personified what they, as new designers, were trying to do. and philosophies. In the case of Norman, she has taken some personal philosophy and translated it into her designs. For the show, her clothes are inspired by “Danse Macabre,” or the “Dance of Death,” a philosophy that focused on the universal reality of death regardless of gender, religion, sexual orientation or ethnicity. Norman loves a bit of drama in her designs. “My passion and kind of craziness — I think that’s what translates to my designs is just my theatrical side. I want to go into haute couture, which is more art over fashion,” Norman said. “I just want people, when they do wear my clothing, to feel the best that they’ve ever felt.” Meanwhile, the major inspiration for Ellis’ designs in the show came from her experience studying abroad in London, U.K. While she was there, she fell in love with the architecture. In particular, she developed a fondness for St. Paul’s Cathedral. “Seeing the beautiful artwork of the sculptures, and the ceiling, and so much gilded gold and [it was] just so luxurious and beautiful,” Ellis said. “That was why I decided to name my collection ‘The Cathedral’ and really try and use that gilded gold aspect [and] beautiful elegance in my designs.” For undergraduates interested in participating in a later Mom’s Weekend Fashion Show, Ellis has three tips. Her first tip was to start as soon as possible. “Get your swatches way early on, do that like first semester,” Ellis said. Her second tip was to just start writing designs down instead of worrying about the specifics. “My last one would be you do spend all night here [Johnson Hall, Room 113], you don’t go to bed sometimes. So, get an espresso machine!” Ellis said. Tuesday April 16 | 10:15 – 11:00am CUB Junior Ballroom Patty Murray is Washington state’s senior senator and was first elected to the U.S. Senate in 1992. Start buil ding credit ! Get rewarded for on-time payments.